If you are biased already concerning Mike Huckabee, I could expect that you might only read the article that favors your already formed opinion. But considering that Mike Huckabee may be by a slim outside change the candidate of choice for the GOP or at least the VP candidate, it is good that these varied issues are addressed by Hillyer and Saltsman before they are addressed in a national campaign. Hillyer may actually be doing Mike Huckabee a great favor by "clearing the decks" in issues before the future battle. And for those who may say that Huckabee will never be President, the same was said about Huckabee never being Governor of Arkansas. After Gov. Bill Clinton left Arkansas to become President, his position was filled by the Lt. Governor - Clinton crony and now convicted felon, Jim Guy Tucker. With the Lt. 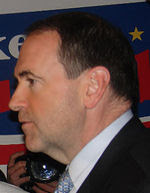 Governor's seat open, a special election was held on July 27, 1993, and without hardly a mention by the national press, Arkansas elected a Republican preacher named Mike Huckabee. Three years later, Tucker had resigned because of a felony conviction in the Whitewater scandal and on July 15, 1996, Huckabee was sworn in as Governor of Arkansas. He served for the next 10 years until term-limits kept him from continuing as Governor.